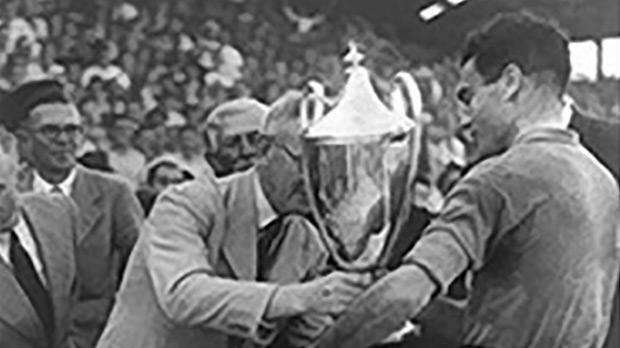 Sliema Wanderers captain Tony Nicholl receiving the Cassar Cup at the end of the 1946 final at the Empire Stadium, Gżira. The 1944-45 football season in Malta was a huge success. After the shambles of the Second World War, the locals were anxious to resume their favourite sport and attended all competitions organised by the Malta FA in their thousands. However, as the season was drawing to an end, the Cassar Cup was still to be held. The donor of the trophy, Anthony Cassar Torregiani, was anxious to hold the charity competition as usual. So, he held discussions with the chairman of the Command Sports Committee and the Malta FA in an attempt to revive the competition. It seems, however, that both the MFA and the Services were not eager to play so late in the season. As a compromise, someone suggested that the Cassar Cup would be decided by a representative match between the MFA XI and the Services selection. Then, if the Services won the match, the final would be contested between the Navy and the Army and if the MFA XI were the winners, the final would be played between Valletta and Sliema Wanderers. It was a novel idea but after more contemplation it was finally decided to postpone the competition to the new season. The next season, the Services gave Sliema and Valletta permission to make use of service players in the Cassar Cup. The RAF were pitted into the semi-finals after winning a lot drawn between the three Services team but the Army and the Navy had to play a decider to select a second representative. The decider was played at Corradino on May 7, 1946 when the Navy won a dour tussle 4-2. The first of the semi-finals was played on May 11 between Sliema and the RAF team. This match failed to reach the expected standard and Sliema won rather easily 5-2. The man who carried Sliema to the final was Tony Nicholl who, although nearing veteran age, was still playing on top of his form. He scored two of his side’s goals and had a hand in the other three goals for his team. The navy made it to the final after a 3-1 victory over Valletta. The sailors’ speed on the ball disturbed the City’s defence. Valletta persisted in trying from the flanks but Formosa could never get the better of left-back Walker. Salvinu Schembri, on the other hand, was marked off the game by Pawlu Friggieri. After only 20 minutes Richardson received a pass from Vincent Friggieri and netted from close range. A few minutes later Friggieri was floored in the area and Morris made it 2-0 from the spot. On resumption, Valletta went straight into attack but it was the Navy who scored their third goal through Ċensu Friggieri. Valletta kept battling on until the last kick of the game but they only succeeded in scoring once. Schembri received the ball from Rodgers and passed to the unmarked Curmi to tap into the net. The final was played on May 19. The match brought to mind the 1938 clash when the Navy, two goals up at half-time, saw Sliema’s great rally not only erase their double lead but also score a third goal which gave them the cup. And, in 1946, history repeated itself. Once again, the Navy scored two goals in the first half but Sliema reduced the deficit through Nicholl seconds before half-time. In the second half, Sliema improved beyond recognition and it was not long before they drew level. Nicholl was tripped inside the box and the referee did not hesitate to point to the spot. Nicholl took the penalty himself and scored. Sliema now took the game in their hands. Catania sent a free-kick soaring into the opponents’ penalty-area. Tanti passed back to Nicholl who shot first time into the net for a great goal. With the Wanderers leading 3-2, the sailors went all-out in search of an equaliser but their spirits were dampened when Borg headed in the fourth and last goal of the match.